A team of astronomers has doubled the number of known young, compact radio galaxies – galaxies powered by newly energized black holes. The newly found 1,500 galaxies will help astronomers understand the relationship between the size of these radio sources and their age, as well as the nature of the galaxy itself. A radio galaxy is a galaxy that shines brightly at radio wavelengths. 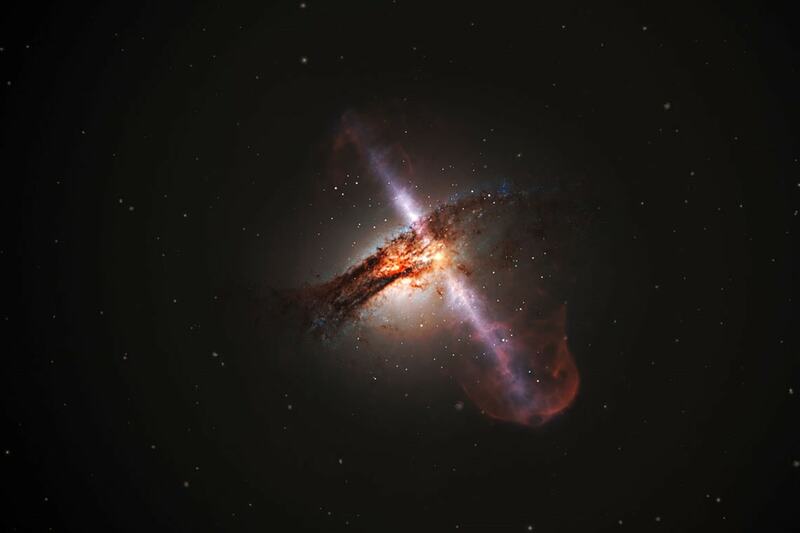 A super-massive black hole – typically with the mass of millions of suns – powers this outpouring of energy. In a survey of ninety thousand radio galaxies, the astronomers identified the radio compact galaxies among them. The results are described in a paper published Feb. 20 in the Astrophysical Journal. “We do not understand how radio galaxies evolve,” says Joseph Callingham, a postdoctoral researcher from the Netherlands Institute for Radio Astronomy (ASTRON) and lead author on the paper describing the result. According to one model, compact radio sources are young because the jets have not had time to reach far beyond the central black hole. The hot-spots are relatively close together and look like compact sources. Over time, the jets reach farther out into the galaxy and even beyond its confines; the hot-spots are farther from each other, and they are seen as a more extended, double-lobed source. However, another model argues that the relationship between the age and observed size of a radio galaxy is not so straightforward. That’s because a compact source may be compact not because it’s young, but because gas within the galaxy is dense enough to prevent the jets from extending far from the central black hole, meaning it remains compact despite its age.